-Start out by laying the glasses on a straight surface. Mark how much you want to slice off the bottom with a marker. Put the shades back on to see if the new shape will suit your face. When you've found the perfect measurements, cut off the bottom bit of the frame with a metal hand-saw. 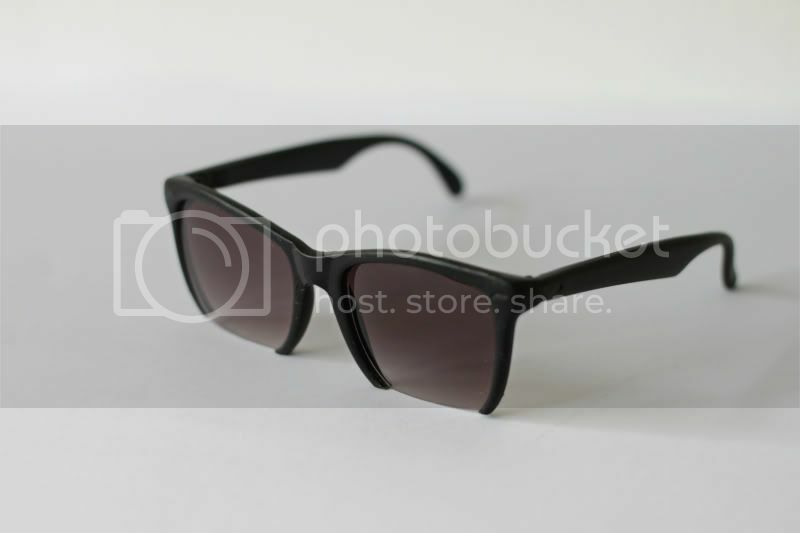 -Click the glasses out of the frame and file the edges that you just cut until smooth. Now you can give the empty frame a matte topcoat. -File the glasses straight from the bottom with a large metal file until they are short enough to fit back in the frame. Compare them to eachother while filing to make sure they are symmetric. 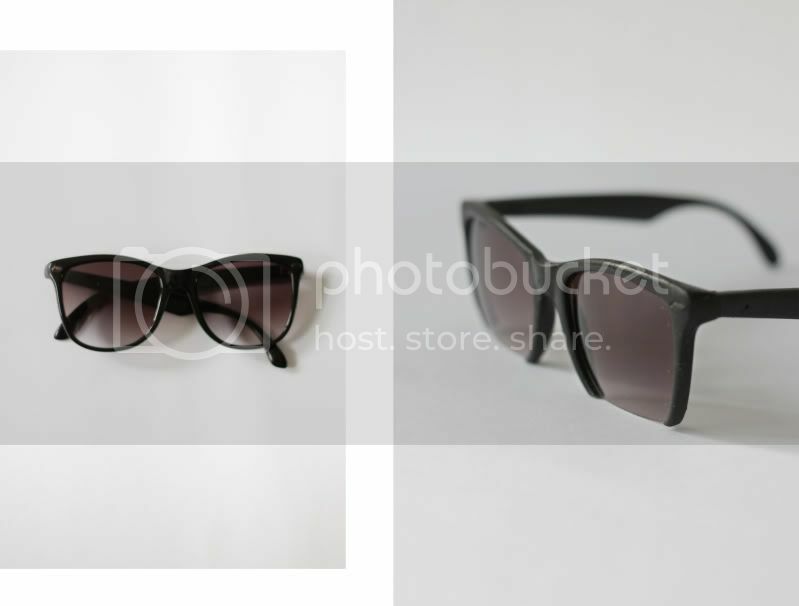 -If both of your glasses are the right size you can put them back in the frame with a little glue. That's it! In under an hour you've got a pair of sliced shades. i just love your DIY projects! That's sooooo great! Love it! VAaaaaaaaaauvvv I LOVE İTTT ! i am so gonna do this awesome diy! thanks for sharing! They look AMAZING on you! I have so much respect for you and all of your projects! absolutely incredible! you have the best diy's of any blog out there. love! I love your DIYs, always so simple, but also innovative. You just gave these old sunglasses a huge favor. Their coolness level is at least 300% of what it used to. xoxo AL / Alice! wake up! Absolutely genius idea! You rock. Dit ga ik zeker proberen, wauw ! Thats so cool I always love your DIYS! Never knew I could do that! NOw I have to try! Ik vind het echt ongelooflijk hoe je op de ideeën van je DIY's komt! Ze zijn altijd redelijk simpel, maar het resultaat is echt speciaal! Wauw... heel gaaf, dit ga ik zeker proberen. Bij de action kan je voor een euro altijd hele goedkope zonnebrillen halen. Ik was laatst helemaal geinspireerd door je futuristische DIY's en heb een smeltende ketting gemaakt (geinspireerd op druipstenen) (ook te vinden op m'n blog),het lijkt alsof de zonnebril in de ondergrond verdwijnt. Gaaf, je inspireert me! Ik dacht echt even 'heh hoezo kan die zonnebril in de tafel zitten'. Echt leuk gedaan weer meid! Wow! This DIY turned out fantastic! Very interesting silhouette! they look awesome. I love this. never would think of doing that but i love it! woowwww! i'm so impressed! just genius! Your DIY ideas are so creative and different. Yes it is inspired but not many would ever think like you. You're so innovative. such an awesome idea..i love this! I loved it! I am totally inlove with this new trend! Very clever! May have to attempt this one myself! Ahaha I'll make sure to be more productive dear!! About MMM plus H&M I'll try to get my hands in a piece but u're right... Martin would be a bit pissed..
Btw love when u commnt my blog n glad u liked my new hair. you should open up an etsy shop!! please!!! Wow! you really thought outside the box! You are so innovative. Thanks for sharing such an amazing DIY! 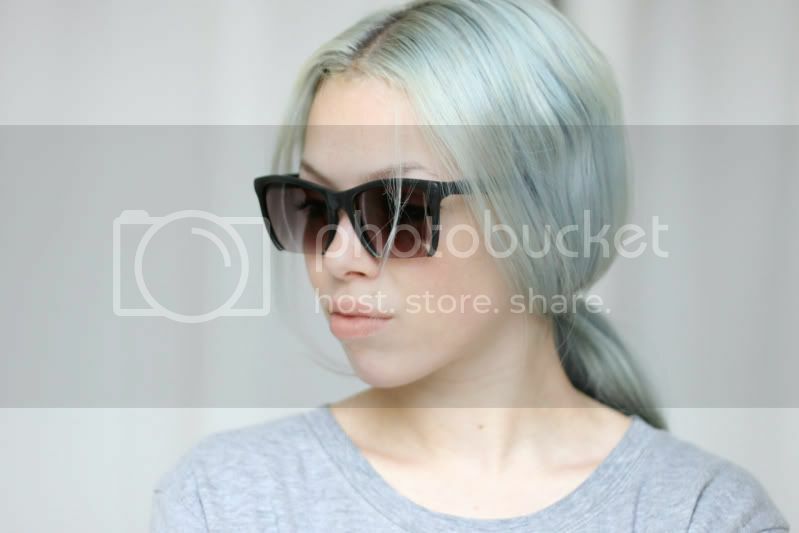 I want these sunglasses now!! your blog always takes my attention so much...I scroll up & down .... ! Ok doing this right now. I can't believe how much it can transform a regular pair of sunglasses! also, <3 andrew from pullteeth. NICE....May I ask what type of saw you used? Those are so awesome! Your DIY projects are always FANTASTIC. Love your blog so much. dit is geweldig! ik had ze nog helemaal niet gezien o: was je niet bang dat je je handen open zou halen aan de glazen? Every single one of your DIY-projects blow me away. This one is soooo cool. Maybe I should try it myself :) Thank you for inspiring me! Love these! Can't wait to try them myself! Thanks for sharing the information with us.The glasses are very stylish and royal to see. I have visited your site all the sites are really good but if you want to be more stylish then visit our site. The Men reading glasses leading feature of this share or writing or newspaper was to form rather which will agreement the separate to impeach the harvest in such a technique which you women sunglasses motorized specs heaver you are fruitful Buy Sunglasses as well as the emissions are not at all moving you’re traveling or reviewing willpowers just as the motorized lenses are so plentiful Polarized Sunglasses lively in while.